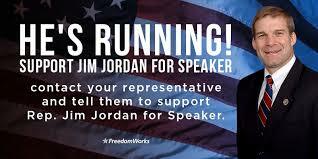 Recent polls showing Jim Jordan House Speaker will drive folks to vote in November. Very impressive. **Crosstabs for the second poll attached. Fox and Friends: Video: Jim Jordan explains why he's running for Speaker of the House. Not to worry about Mark Meadows vote. You need to call swamp thing Patrick McHenry who wallows with the Ryan gators. - When President Trump entered office, we expected to see more Conservative legislation pass through the Republican-majority House. That did not happen. - On immigration, we saw Speaker Ryan undermine President Trump's border security proposal by offering amnesty to millions of illegal immigrants. Jim Jordan was not swayed by Leadership pressure and voted against the Speaker's bill. - On education, Speaker Ryan sponsored a bill that expanded data collection and sharing among all federal government agencies. This is particularly harmful for children who are enrolled in public schools. Other agencies can take advantage of this data by forcing certain curriculums and career pathways into the school system. - Current House Leadership passed the horrendous Omnibus bill that increased spending and resulted in making the President mad. The President said he would never sign a bill like that again. - The House still hasn't repealed Obamacare or defunded Planned Parenthood. These are promises that Republicans have ran on for years. House Leadership keeps thwarting this progress. - Jim Jordan has lead the Freedom Caucus to take a strong, Conservative stance on these issues. He has never been influenced by those in power like McCarthy and Scalise have. His voting record has been consistent throughout his tenure with the House and has been independently outspoken on these issues.